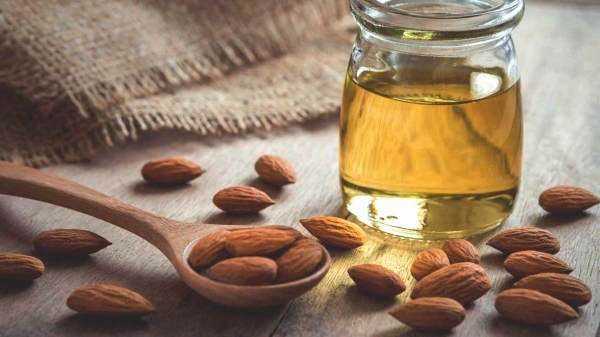 Home health Frugal uses for Almond oil ! Frugal uses for Almond oil ! Almond oil extensively known for its health benefits is very popular in Southeast Asia and in Mediterranean region. Almond oil is very rich in Vitamin E and vital nutrients which is very healthy for skin and hair. Almond oil is very mild in nature and it’s a very effective anti-oxidant for our skin. Applying this oil regularly on skin makes the skin glow and protects the skin from UV rays. It also helps to get rid of dark circles. Massaging with few drops of almond oil under eyes at night and next morning washing the same with water helps to improve dark circles and reduce eye strain. Almond oil helps to remove tanning. Applying mixture of equal portion of almond oil, lemon juice and honey on affected area helps to reduce the effects of tanning. Almond oil is rich in zinc and because of this property it is a very effective remedy for skin rashes. It also helps to reduce the effects of skin ageing. Apply mixture of almond oil and drops of Vitamin E capsule on face and massage. After 20 minutes, wash your face with lukewarm water. Doing this twice a week will give good results. Also eating almonds every day in morning helps to remain healthy. Almond oil is a very effective treatment for hair loss as it is rich in zinc and magnesium. Applying almond oil to the scalp at night and rinsing the same next day with mild shampoo gives results.